Whether building your dream home, an extension, a new housing estate or new warehousing, Thermo-Foil ES and Eco-Brite are specifically developed to enhance the U-value of ceiling, wall and floor insulation. In combination with fibre insulation, they can provide the most cost-efficient insulating method to meet the requirements of current Building Regulations. Both membranes have BBA Approval and have been designed and tested to last the lifetime of a house or structure, in the UK that is 60 years. Our products can also be used to restrict the ingress of landfill gases and airborne radon into a building and are rodent-resistant making them suitable for use in agricultural buildings. For installation with floors, walls and roofs in domestic houses, modular and portable buildings. Eco-Brite is a single foil membrane for use as a heat reflective lining within the fabric of homes, domestic and commercial building components including modular structures. Eco-Brite has an emissivity of only 0.03, so over 96% of radiant heat is reflected back (hot or cold). Every square metre used will save up to 23Kg of CO₂ per annum on an un-insulated wall and 12.33 Kg of CO₂ per annum on an insulated wall. Eco-Brite holds BBA Certification (No. 08/4576) Dubai Municipality Certification, Fire certification to BS476 Part 6 and Part 7, and has been designed and tested to last the lifetime of a house. To act as a radiant barrier Eco-Brite is installed within a structure facing at least one air space, (usually 19mm to 25mm). When used in conjunction with mineral wool or foam insulation Eco-Brite can improve the u-value of that structure by up to 18%. Its inclusion will reduce the thickness of the soft insulation required, substantially minimising energy needs and improving comfort for occupants. Apollo’s high performance adhesive tape can be used to seal the joins between adjacent sheets, around stud-work, door or window frames. For installation with floors, walls and roofs in large domestic, commercial and industrial buildings,also branded as Thermo-Brite III. This tough product, with its Valéron core has been specifically engineered to withstand the rigors of site work. 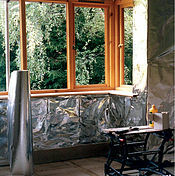 Thermo-Foil ES has an emissivity of only 0.03, so over 96.5% of radiant heat is reflected back (hot or cold). Thermo-Foil ES has BBA Approval, (Certificate No. 08/4576) , Fire Certification to BS476 Part 6 and Part 7and Dubai Municipality Certification. It been designed and tested to last the lifetime of a house. Our high performance tapes for use with all our products. Apollo Insulation Ltd has developed two high performance, heat reflecting tapes for use in the building sector, Thermo-Foil and EncaSeal Tape. Apollo’s Thermo-Foil Tape is used to seal the joins between adjacent sheets, of Eco-Brite and Thermo-Foil ES. It is also used to seal off these products around stud-work, door or window frames. So without having to using a variety of other tapes the structure can be effectively sealed preventing air infiltration and ensuring the building meets its mandatory air pressure test. The aluminium surface of the EncaSeal tape has a special coating that ensures it’s UV resistant, bright surface never tarnishes. 100% waterproof and bug proof, this Class 0 fire rated material has a tough high density polyethylene (HDPE) substrate core essential for a long working life and keeping wastage to a minimum during installation. This foil has one side of adhesive for bonding to a variety foam boards, to create a superior insulation product. InsuFlect is a composite sheet material designed to be bonded to board materials to enhance their performance. InsuFlect comprises of a 12.5 micron aluminium foil bonded to a Valéron® core which in turn is bonded to stout kraft paper. The paper acts as an interface allowing the foam to adhere to the InsuFlect. Outperforming other material’s currently in use, the reflectivity of the bright aluminium foil on InsuFlect™ has an emissivity of only 0.03, so over 96.5% of radiant heat is reflected back meaning most of the infrared energy striking its surface is effectively blocked. Our extra strong foil for installation in agricultural buildings. The Apollo AgriLiner is a two sided single foil for use as a heat reflective lining. It is engineered to provide a cost effective Bio Security System that greatly improves conditions inside poultry houses, increasing flock health and growth ratios by helping to reduce the detrimental effects associated with hot or cold stress, gas build-up, biological contaminants and cross infection. By simply draping the AgriLiner over or under the poultry house rafters, more than 96% of the radiating energy will be blocked resulting in much less stress on the birds. The system performs the same function when fitted to walls and can even act as an excellent vapour barrier helping to stop the ingress of outside humidity where this is a problem. The reflective property of the material also means electrical power required for lighting the interior can be reduced. Terrethene has been developed for sub-surface applications. It is a multi-layered membrane made from polyethylene, aluminium foil and high tensile woven substrates that block the migration of vapour, moisture, water and various environmentally harmful gasses. These laminated films combine to form a membrane that protects against Methane (CH₄), Carbon Dioxide (CO₂) and Radon gases and Hydrocarbon vapours. An additional benefit is the partial plastic memory, which allows the membrane to be used in three dimensional detailing of building structures. Our reflective membrane with micro perforations for breathability. Thermo-Foil P is a two sided single foil for use as a heat reflecting membrane. It holds the same reflectivity and tensile properties as Thermo-Foil ES, but has micro perforations for breathability. Thermo-Foil P has an emissivity of only 0.03, so over 96.5% of radiant heat is reflected back. The product can be installed in any type of building where a breathable Heat Reflecting Membrane is desirable. It also allows Water Vapour Permeation.